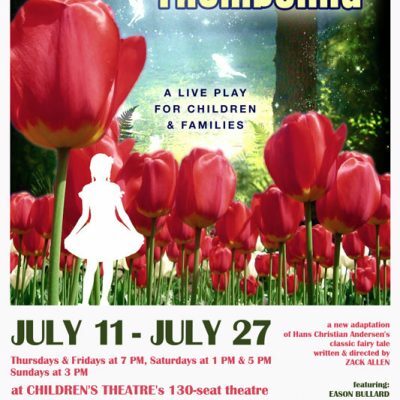 Knoxville Children’s Theatre will present a clever new re-telling of the Hans Christina Andersen fairy tale Thumbelina. The play will be performed July 11 through 27, Thursdays and Fridays at 7 PM; Saturdays at 1 PM and 5 PM; Sundays at 3 PM. The show is KCT’s 59th full-scale production and features 12 young actors in the cast. Tiny Thumbelina was supposed to be married to Navarre, prince of the Pixies, but a mysterious sorceress has cursed her to lose her memory in order to have the prince for herself. Thumbelina has many adventures on her way home, escaping from an amorous toad, surviving a fall off a flying hummingbird, and getting assistance from a tarantula and a courageous fortune teller.. Meanwhile, the Prince is under pressure to choose a new Princess, and Thumbelina’s return may be too late to claim her crown. KCT’s Thumbelina is a modern re-telling of the Hans Christian Andersen fairy tale, using elements of Homer’s The Odyssey, and the plots of many other familiar fairy tales, such as “The Ugly Duckling” and “The Princess and The Pea.” Famous characters from the worlds of The Odyssey (such as the soothsayer Cassandra) and Fairy Tales (such as Goldilocks and Red Riding Hood) combine into an unforgettably humorous and adventuresome tale. KCT is Knoxville’s leading producer of original stage plays. Thumbelina is the 14th original full-length play by Zack Allen to be premiered by Knoxville Children’s Theatre. The company has produced a total of 21 premieres since 2008. KCT is one of Knoxville’s best-attended theatre companies. Three productions this year have garnered more than 1,100 attendees each. The play is performed by 12 talented young actors, from ages 9 to 17. Isabelle Hannah plays Thumbelina. A veteran of over a dozen plays, Isabelle attends Nature’s Way Montessori School. Kena Holmes and Audrey Jones, students at West Valley Middle School, play Goldilocks and Red Riding Hood, respectively. Lucas Cunic, who attends Grace Christian, will play Prince Navarre. Five actors are making their KCT debuts: Hannah Crowder-Starnes, Megan Henley, Sophia Medley, Ani Werderitch, and Olivia Wilson. The rest of the cast includes KCT veteran performers: Eason Bullard, Ella Gibson, and Averi Richardson. The play is written and directed by Zack Allen. Liel Kirk is the Production Manager. The play’s stage manager is Jaden Lily Branson. Brooke Cunningham will provide the scenic design, and Rose Bolton will design and build the costumes.